Character design is probably one of the most enjoyable slices of the creative media. Generating a unique visual look for a concept which is not yet existing is a major foundation in the whole creative process. An today we try to bend the rules and introduce you an exceptional character designer who tried to incorporate his own unique idea into other existing concepts and characters which resulted into an amazing collection of crazy and funny character designs. Korean artist Sakiroo Choi have created something viral since last year. His work, called the “Yellow Lemon Project“ is now everywhere in the world – from various exhibits to prints and collectibles. 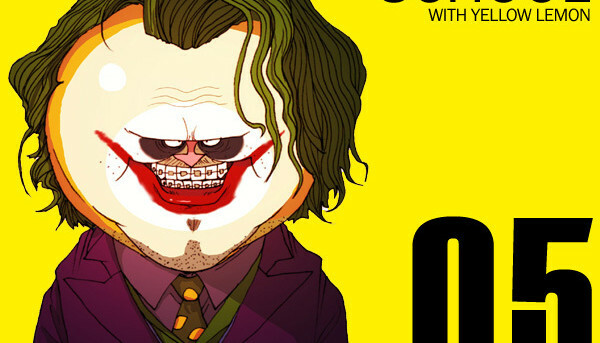 It is a collection of interesting character redesigns ranging from comics, anime, artists, brands, movies and other pop culture icons. The idea is so simple but there is one special element that makes each character look so funny yet amazingly drawn – a lemon, obviously. The concept is that there is a special school where each student is a celebrity wearing uniforms and divided into classes – the Movie class, Comic class, Brand class, Artist class, Animation class, Game class and Natural class. Each character in more than a hundred illustrations is well represented in an awesome, evil-looking and funny way. You might have stumbled at some of these crazy illustrations somewhere, but to refresh you and get you inspired with the creative kick you need in whatever project you are doing, we here at You The Designer will feature today some of these crazy illustrations. Enjoy! Be sure to check out more wacky characters from the Yellow Lemon Project and other amazing illustrations on Sakiroo’s Behance page. Which among the lemons are your most favorite? Tell us your thoughts and suggestions by commenting below. Find us on Facebook, Twitter and Google Plus for more updates, design news and features, or better yet subscribe to our blog for the latest design inspirations, stories and freebies. Stay awesome everyone!